When food is bland, the response is almost automatic: Reach for the salt. But, little by little, each reach can add up, harming your health. Too much sodium—a mineral in salt—may raise blood pressure and increase your risk of heart disease. Sodium is essential for survival, but we only need a little. Most Americans get a lot. The national average is more than 3,400 mg a day. 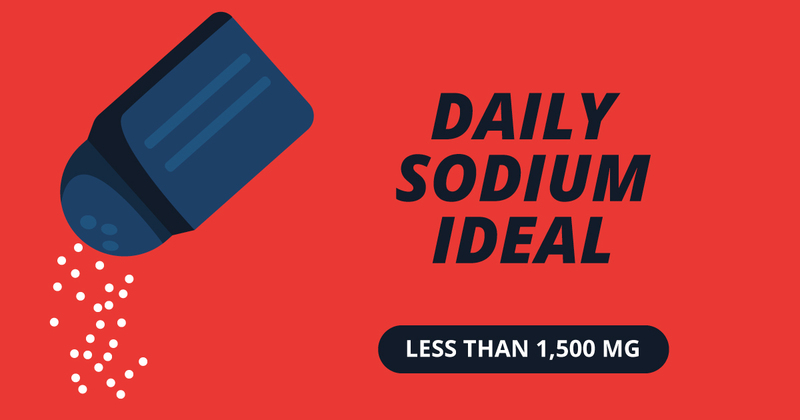 The American Heart Association recommends that most people consume less than 1,500 mg of sodium per day, especially if they already have high blood pressure. Here are 10 tips to help you reduce the amount of sodium in your diet. 1. Cut back on prepackaged foods. Cold cuts and cured meats. Snacks (like chips and pretzels). Increase the whole, unprocessed food sources in your diet. These are generally the lowest-sodium foods you can eat. It makes sense that if your diet emphasizes unprocessed foods, you’ll eat fewer processed, high-sodium foods. Dried beans, peas and other legumes. Whole-grain foods prepared without salt, such as brown rice, wild rice, oats and barley. 3. Learn what marketing terms mean. Sodium-free or salt-free means the product has less than 5 mg of sodium per serving. Very low sodium means it has 35 mg or less per serving. Low sodium means it has 140 mg or less per serving. Reduced sodium means the product has 25 percent less sodium than the regular version of that product. Light in sodium or lightly salted means the product has at least 50 percent less sodium than the regular version. Unsalted or no salt added means no salt was added during processing (although the product may have naturally occurring sodium). Cured meats (such as ham, bacon and corned beef), lunch meats, sausages and hot dogs tend to be high in sodium. Choose fresh poultry, fish and lean meats instead. If you want deli meat on a sandwich, choose a low-sodium variety and use just a few slices. Then complete your sandwich with fresh vegetables—such as avocado, tomato and lettuce—and use low-sodium condiments, such as mustard or hummus. 5. Think before you salt. Taste food before salting it. Once you break the habit of reaching for the shaker before you eat, you may be surprised by how much you can enjoy your meal unsalted. Take the saltshaker off the table. Keep the pepper on the table, and use it instead of salt to impart flavor. Each day, reduce the amount of salt you add during cooking by a little bit until you add none at all. And don’t add salt to rice, pasta or cereals when cooking. To get the most flavor from your herbs, crush or rub them before adding them to the dish. And buy herbs in small amounts as you need them rather than storing them for a long time. 7. Boost flavor with spices instead of sodium. Reduce salt and experiment with flavor by using spices. For example, try cinnamon or nutmeg in soups or on vegetables such as winter squash and carrots. Pair cloves with fruit or beef. Try curry powder or cumin to flavor corn, tomatoes and fish. Note: If you’re cutting back on salt in a recipe, you may need to add a little more spice than the recipe calls for. 8. Don’t be fooled by different kinds of salt. Iodized, kosher and sea salts all contain sodium. Common table salt is approximately 575 mg of sodium per ¼ teaspoon. Keep in mind that kosher salt and sea salt have larger grains, and therefore may have less sodium by volume. Salt-free seasonings can be a great way to add flavor without adding sodium. Sodium-free options may include some Cajun spice blends, Italian seasonings or Chinese five spice blends. Onion powder and garlic powder are also good choices, rather than onion or garlic salt. Be sure to check labels. Some blends that don’t sound salty do contain sodium, including some kinds of lemon pepper, popular seasoning blends and meat tenderizers. Other salt-free seasonings that can add some zing to your cooking include fresh lemon; balsamic vinegar; fresh garlic; or a flavorful oil, such as toasted sesame or walnut. Sodium can be found in products as diverse as butter, bouillon, baking soda, condiments, peanut butter, milk, cereals and breads. Reduced-fat or nonfat items also may have a lot of added sodium. So it’s important to check nutrition facts labels and choose items with the lowest sodium content. Sodium is listed on the nutrition facts label in terms of milligrams and % Daily Value (DV). Foods with 5 percent or less DV of sodium are considered low in sodium. Anything above 20 percent is considered high. You can find a lot of information about a food by reading its label.